Seaweed health benefits are legendary. Seaweed is one of the greatest health secrets - a true "super food". This may seem surprising - that such a humble and common class of plants could offer us very much in terms of health. But seaweed health benefits have been known for a long time - and modern science is revealing more and more about this super-food. The fact is seaweed is packed full of much-needed vitamins and minerals, including some relatively rare trace elements. 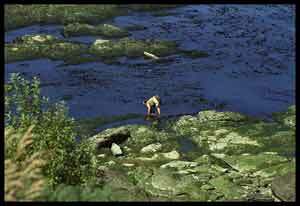 Picture, above: A woman harvesting seaweed in Chile. Picture thanks to Relapsed Nun on Flickr. - a bit of pre-history! Humans have been eating seaweed for millennia. Many early communities lived close to the shore because the seas offered a constant and dependable food source. Neolithic communities in Britain for example clustered around coastal lands where rich and diverse foodstuffs were readily available. The west coast of Scotland is peppered with brochs and burial chambers from Neolithic times and earlier. The farmers of those times would certainly have supplemented their shellfish and seafood diets with some of the local seaweeds. Some of these traditions are far from extinct. In Wales lava bread is well known and still eaten today. Ireland, too has a rich tradition of seaweed harvesting and use which is now finding new and wider markets. Japan and China are famed for their seafoods and some sought-after gourmet seaweeds come from there. Seaweed health benefits and seaweed eating have been mainly explored by island and coastal peoples. Japanese culture has developed seaweed cuisine to a notable level. The flavours and textures add a subtle and exotic element to Japanese food which has made it increasingly popular in the west. They have perhaps exploited seaweed's culinary possibilities more than any other nation. Where most nations manage one or two seaweed types at most, the Japanese have five common types in regular use. In Japan people take seaweed eating seriously; as much as 4 kilograms is eaten per person per year! Here are a few facts about seaweed benefits for our health. So what's the deal? Why is seaweed such a wonder food? And is it worth incorporating it into our daily lives? What can it add to a green lifestyle? Seaweeds are algae and they have unique health and nutritional properties. Algae use sunlight to photosynthesise food for themselves but they are far simpler in structure than most land plants. Here are some of the main types of seaweed available in the west. The main health benefits are described with each type. You don't have to trek down to the sea; most of them should be available in a health food outlet somewhere in your neighbourhood. Failing that, you can buy some of them mail order. Laver or lava (Porphyra umilicali) is the word for a type of kelp much used by the Irish and the Welsh. In Wales it is still made into flat cakes called lava bread. Japanese Nori is a similar plant; there are several good variants available. The Welsh still eat their lava bread with cockles and sometimes with bacon. It is now mainly harvested in Scotland. Nori is rich in iodine and iron and quite high in protein. It is also a good source of vitamin C, vitamin A, potassium, magnesium and riboflavin (B2). Not only does it have all these nutritional riches, it is also a low-fat food! Nori is a type of laver sold in the west. It's an important part of Japanese, Chinese and Korean cuisines and is now a multi-million dollar industry. Nori tends to be sold as flat sheets or flakes. It is also often toasted. If you have eaten sushi, chances are that you have eaten nori; it is often used for wrapping rolled pieces of sushi. The Japanese and Chinese industries are still quite labour-intensive. Ways to modernise seaweed production have been sought but so far no really intensive system has been developed. The seaweed grows on racks or ropes over 45 days. However, the harvesting is increasingly mechanised and the finished nori is produced and packed in modern factories. Palmaria palmata, or dulse is reddish brown and is accounted a delicacy by many. It has doubtless been harvested for many, many a century but the earliest recording of it is 1400 years ago; St Columba and the monks of Iona ate it. Icelandic peoples also used it from early times. Now it is being cultivated and sold as a gourmet food. In Nova Scotia it is called Sea Parsley and is sold fresh. The Irish call it "dilisk" or "dillisk" and you can buy it as a snack food in some pubs. You can just harvest it yourself from rocks where it has dried in the sun. It grows in the inter-tidal regions, so it is relatively easy to access. If you are concerned about salt levels (sodium) you can soak it overnight in a mixture of milk and water. You should always make sure that you harvest from uncontaminated areas of shoreline. Take advice from your local authorities and environmental experts if in any doubt. Unfortunately, many coastal areas are far from clean because many pollutants from petrochemicals to human waste. Dulse is exceptionally nutritious, containing around 10 - 20% protein and a whole slew of vitamins and minerals, including magnesium, iron and beta carotene (which the body uses to manufacture vitamin A.) It is now being farmed in Ireland and elsewhere for its health benefits and for making skin care and cosmetic products. Picture, above: Irish moss or carragheen and pepper dulse. Pepper dulse is the feathery looking one. Picture thanks to Akuppa on Flickr. Carrageen, or Irish moss, (Chondrus crispus) is widely used in all sorts of food products because it has emulsifying and gelling properties. It is used to thicken foods and produces a colourless jelly-like consistency, so it is used in lots of commercial desserts. It's also the vegetarian answer to gelatine. It has lots of nutritional and health benefits, too. In Ireland it was traditionally rated as a cold and cough remedy. It is rich in retinol and minerals. Kelp (Laminaria digitata)is found in many areas of the world. It is a brown seaweed with literally thousands of varieties. It is found in all sorts of commercial products, from toothpaste to fertiliser. As it is exceptionally rich in iodine, it used to be the main source for preventing goitre and treating thyroid conditions. It is still highly rated by naturopaths and nutritional therapists for that use. As it also has binding and stabilising properties kelp is used in many commercial applications. However, it's a really great natural health food. It is sold in health food shops very often as Kombu (the Japanese name). The Chinese make a traditional soup stock called "dashi" from it. Japanese kombu is usually Laminaria japonica. It is now extensively farmed around Hokkaido and in China in the Yellow Sea area. Arame, another Japanese seaweed is also a type of kelp. Kelp or Kombu is a great source of iron, magnesium and folate (vitamin B9). Wakame (Undaria pinnatifida) is a type of kelp. 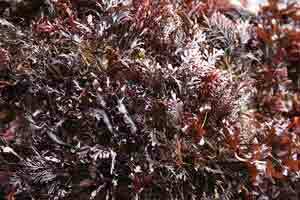 It's a tasty and valuable seaweed which can be added into soups and stews. Wakame is mainly produced in Japan and the far east though there are now wakame producers in France (Brittany). It is regarded as a serious pest in New Zealand because it is invading coastal waters. Wakame is a green seaweed with a slippery consistency and an almost sweet taste. It has a thick band of fibre in the centre which can be easily cut out to give a more palatable effect. If you make soup with it you could be forgiven for thinking you were eating fish soup. It can easily be added in small amounts to lots of cooked dishes such as stir-fries and stews. It's also delicious as a side dish. The Japanese use it as part of miso soup. Alaria esculenta is a type of kelp common in Britain which can also be eaten. The popular name is "winged kelp". It's also found in many other northern maritime countries such as Iceland and Norway. Other seaweeds which are perhaps less commonly found in the shops include "sea lettuce" and "sea spaghetti". Sea lettuce (Ulva lactuca) looks a little like land lettuce and can be added to salads. Sea spaghetti (Himanthalia elongata) can be cooked just like pasta spaghetti and used in the same way. Sweet kelp (Laminaria saccharina) is a sweeter version of kelp. Crofters in Scotland used to feed sweet kelp to their sheep as it produced a sweeter mutton. Now it is being promoted as a health food with endocrine system benefits that may help prevent breast cancers. It can also be found as an ingredient is some sushi restaurants' offerings. Where can you buy seaweed? There are several seaweed producers now in Ireland, Scotland and Brittany for example, which may supply local outlets. If you buy your local (or near-local) seaweed you are helping sustain local industries and keeping the carbon footprint of your seaweed-eating within reasonable limits. Packed, dried seaweed is quite lightweight. Nevertheless, it is an enormous export industry in the far east particularly. If you live in the west, it would make sense to eat your local seaweeds in the main in order to help reduce the environmental costs of shipping. Many seaweed harvesting companies use traditional methods. They also need pristine seas in order that their products are not contaminated by pollutants. Supporting these industries therefore, helps indirectly in the quest for a cleaner, less polluted planet. There's no doubt that the many seaweed health benefits make it an excellent item to include in your diet - and it may well be a green thing to do, too. This is a cheap and natural health food which is available to almost everyone. It's certainly worth getting some seaweed health benefits into your life! Buy your seaweed from reputable sources, where possible and help sustain good environmental practices. In this way, you are promoting your own health and adding to your green living because you are helping nurture a relatively green industry.